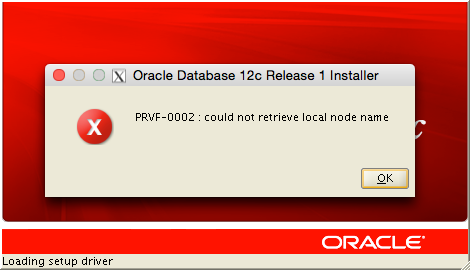 If you get the message above after running OUI (runInstaller) the message simply indicates that OUI is unable to retrieve the name of the local node. To determine why this happens you can validate using hostname command. To get additional information use the --verbose flag. It now becomes obvious that the resolution using gethostname() is failing. Hostnames in Linux can be resolved using the /etc/hosts or a name server .e.g DNS. If a name server is not in use a quick check of /etc/hosts will reveal that an entry for the hostname (matthew) is not present. Create an entry for the host and verify that it can be resolved. Now run OUI again and the issue should be solved. While the problem is fairly trivial and for those who read the database installation documents obvious, this was to demonstrate how hostnames are resolved in Linux.